At the end of 15 weeks I went out for a three mile run and didn’t pay too much attention to my pace though I could feel that it was slow. I thought for sure I’d average out at 9:30 for that short run. It was an early run, before sunrise, and there is no doubt the morning run is still the way to go (vs running midday). I was pleasantly surprised to find that my average pace for that run was 8:58/mile, just squeaking in below 9 minutes. My new weekend routine is now that I go for a bike ride on Saturday afternoon while our son naps and then an early long run on Sunday. I like this routine quite a bit. The cycling is helping me train for Tour de Cure in May where I’m really hoping I can hang for 32 miles. The Sunday run is a 6.8 route with a flat stretch until the halfway point where there also happens to be a ranger station along the B&A trail with restrooms. Enough said. The second half of the loop is a perfect hilly mix and for probably any number of reasons is typically faster than my first half. Pregnant or not, I usually need a couple miles to warm up so I inevitably end up with negative splits more often than not. This makes for a very satisfying run. Even though that recent 3 miler was a hair under 9 minutes, I have a feeling that may be the last time that happens for the next 5 months. My long run averaged out at a 9:38/mile pace. I proclaimed a few weeks ago that I wanted to maintain sub-9s for as long as possible, at least on the shorter runs. I now know what “as long as possible” equates to. 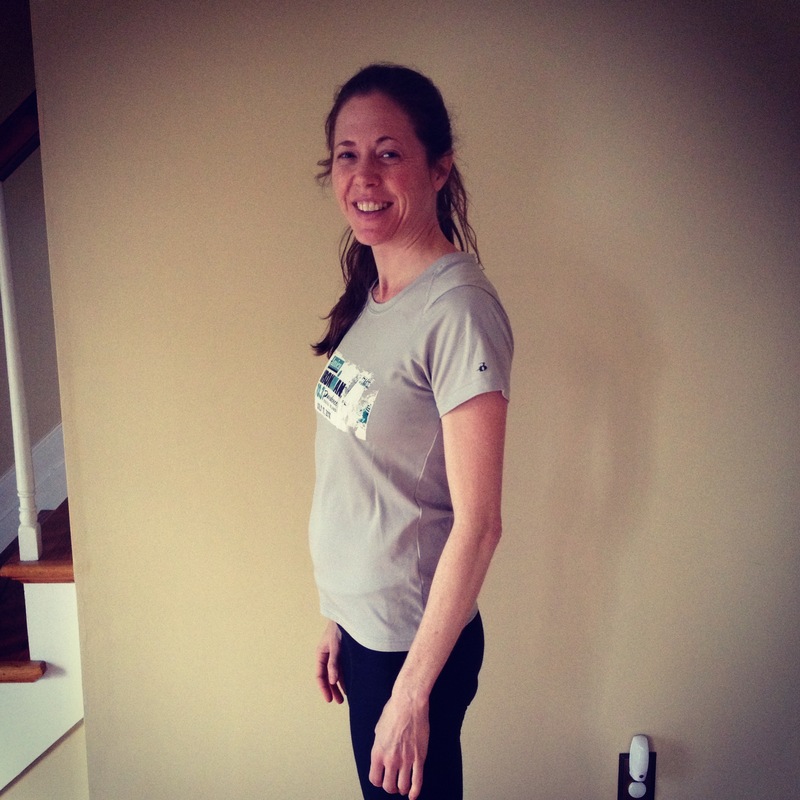 At 16 weeks pregnant, my new pace is slow and steady. I am hoping, however, that I can still finish the next 10k race in under an hour. At the 6.2 mark on the long run my time was 58:38, so we’ll see. Two more weeks could make a big difference in how I perform, even in the spirit of race day. I got curious though to compare my distances and paces from this current pregnancy with round one. The biggest difference is that I went into that pregnancy marathon ready and into this one barely half marathon ready but with speed like I’d not had before. In 2011 I finished the Marine Corps Marathon at the end of my first trimester. From there I kept up with 3-6 mile runs until about week 18 but I was averaging 10+ minutes per mile. In comparison, I’m currently only running 2-3 days a week, with those runs also 3-6ish miles (plus 2 days per week spin/cycle and cross-train), but I’m a solid minute faster at the same point in pregnancy than the first time. Just interesting. And regardless, the point is to stay fit, keep exercising, keep running and keep moving. One week at a time. This entry was posted in Running, Running Pregnant and tagged 10K, cycling, Exercise, running pregnant, Spinning on March 23, 2014 by Natalie.